Before a pilot takes the plane up, he reviews a pre-flight checklist to determine what’s happening in the current location and along the way to the final destination. In the same spirit, we need to evaluate what are the key issues occurring in the four areas of our business: market, customers, competitors and our organization. Setting strategy and determining resource allocation without a thorough assessment of the current context of the business is akin to a doctor prescribing a drug without asking the patient questions or doing any diagnostic tests. In my conversation yesterday with Forbes.com contributor Jim Blasingame, known worldwide as The Small Business Advocate, he coined 2010 the “Age of the Customer.” Jim’s thoughts centered around the fact that many organizations have lost touch with their customers and the true value they were once providing to them. To Jim’s point, customer analysis is an integral part of the four area resource allocation review and there are a number of tools such as Value Factor Analysis and the Growth Matrix with which to attack it. 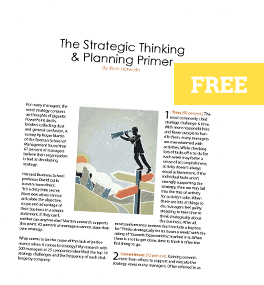 What other tools are you currently using to think through your business in preparation for setting strategy and determining resource allocation?